To see pc's go to www. wellcraft.com 290 Coast. 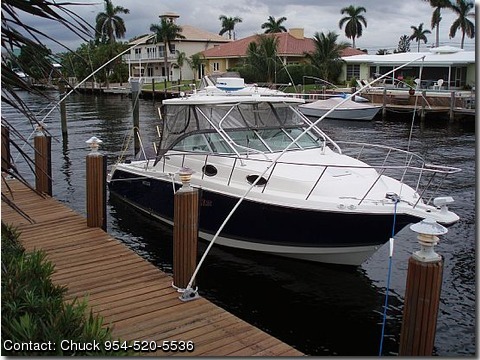 With Bottom Paint New Accessories Hard Top VHF IC- M504 Furuno- Nevnet Furuno Radar TR-1 Autopilot SeaKey In-Hull Removeable Depth Transducer Wash Down Salt & Fresh Water Wire for Dep Drop A/C 7000 BTU W/ Heat, Generator 5.0 K W Gas Head W/ Over Boad Dischange LCD TV/ DVD TV Telephone Inlet & Antenna Clarion W/ Sirius 5 CD Changer Fully Equipped Gally W/ Cappet Sleeping Capacity 6 Head Room 6' 2" Fuel 225 Gal. Water 42 Gal. 42 Gal Bait Well W/ Light Outriggers Taco Grand Slam Windless W/ 300'Rope/Chain Elec. Up/ Down Extra Rod Holders Much More.